This site is for advertising purposes. The MSI GE62VR (15-inch) and the GE72VR (17-inch) are powerful gaming notebooks using a combination of Intel Core i7 processors and the latest GeForce GTX 1060 Pascal GPUs from Nvidia. The package is rounded off with high-quality 4K IPS displays with very wide color gamut (100 % sRGB + 72 % NTSC for the GE62 as well as 100 % AdobeRGB + 100 % NTSC for the bigger GE72). The laptops are also equipped with Nahimic 2, 2.1 channel Dynaudio Sound with particularly high output levels as well as a high-quality SteelSeries keyboard. 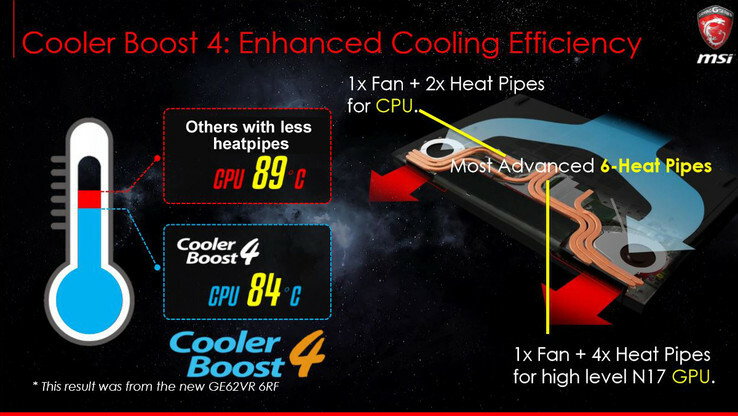 MSI equips the GE62VR and GE72VR models with the new Cooler Boost 4 technology to ensure the best possible heat dissipation. Inside the laptop are six heat pipes, and two of them are exclusively taking car of the CPU cooling, while the remaining four take car off the heat from the GeForce GPU and transport it to the two system fans. The air flow is directed from the front of the notebook over the cooling components towards the back, so the areas next to notebook are not affected. Thanks to the latest GeForce GTX 1060 graphics card from Nvidia, both the MSI GE62VR and the MSI GE72VR are more than 50 % faster than the previous models, which were equipped with the GeForce GTX 970M. This also means the two laptops are VR-ready and ensure steadily high frame rates even at the highest resolutions. Keep cool - everytime, everywhere! MSI's Cooler Boost 4 does not only enable record scores in the benchmark test, but also ensures low temperatures inside the case. This is particularly important for gaming, where you always have to be able to utilize the highest possible performance. The results are pretty impressive in our load simulation with the 3DMark Fire Strike Stress Test: While the CPU is running at low temperatures of around 50 °C all the time, the GPU also levels off below 70 °C, which is completely uncritical. The frame is also steady at 60 FPS – perfect for smooth gaming experiences in combination with great graphics. 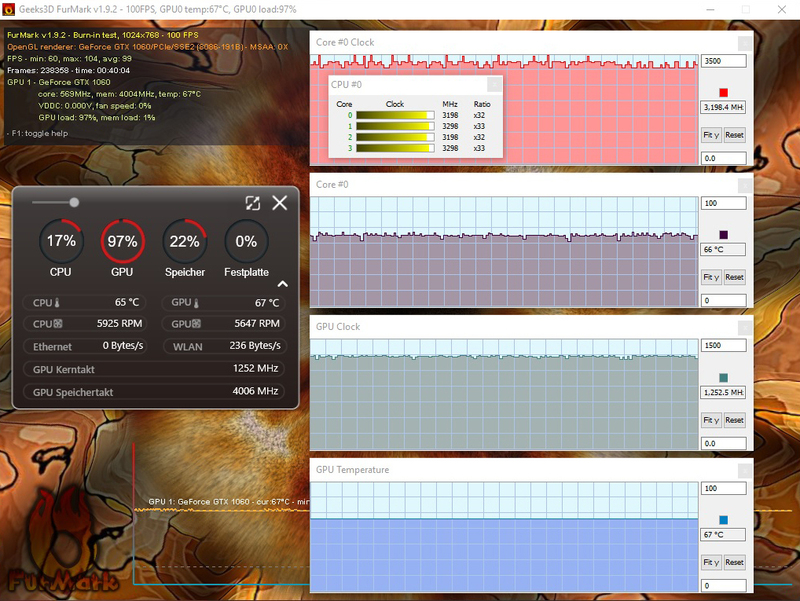 A direct comparison (tested with maximum GPU load in the FurMark Burn-in Test) shows the effect of MSI's Cooler Boost 4 quite impressively. The core temperatures already stay conveniently low at 71 °C (CPU) and 72 °C (GPU) even with the default fan control. If you activate the Cooler Boost 4 technology (you just have to press a button), the temperatures will drop significantly to just 65 °C for the CPU and 67 °C for the GPU! 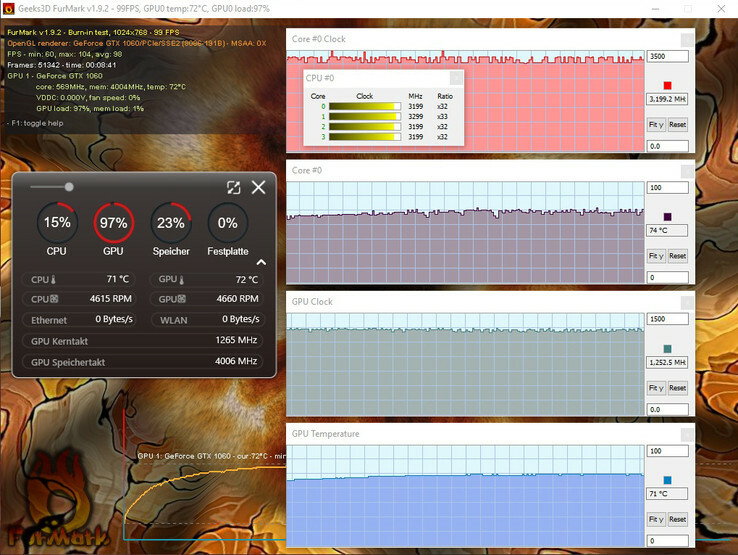 Cooler Boost 4 activated: Only 65 °C CPU and 67 °C GPU temperature – Reduction by 6 °C for CPU and 5 °C for GPU!